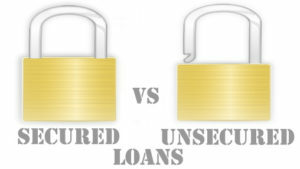 A loan typically falls under one of two categories: secured or unsecured. Even if the total dollar is the same, there are some key differences between these two types. So if you’re a small business or entrepreneur who’s in need of capital, you should familiarize yourself with the differences between a secured loan vs unsecured loan. Only then can you can choose the best loan for your professional needs. The primary difference between unsecured and secured loans lies in collateral. With a secured loan, the borrower is required to place an asset (car, property, etc.) up for collateral. This provides reassurance to the lender, as the lender can take possession of the collateral if the borrower fails to pay or otherwise meet the obligations set forth in the loan contract. In contrast, an unsecured loan does NOT require an collateral on behalf of the borrower. Common examples of unsecured loans include personal loans, bank-issued business loans, student loans, and credit cards. It’s important to note that requirements for obtaining a loan vary depending on whether it’s a secured or unsecured loan. Lenders are generally more willing to provide business owners with secured loans, simply because the collateral serves as an insurance policy so to speak. If the borrower doesn’t pay, the lender can recoup some if not all of their expenses by taking possession of the borrower’s collateral. If the borrower fails to pay back an unsecured loan, the borrower could actually lose money on the deal. You can expect requirements for obtaining an unsecured loan to be more strict than the requirements for obtaining a secured loan, simply because of the collateral. Generally speaking, secured loans have a lower interest rates than their unsecured counterpart. Again, this is because there’s collateral used with secured loans. Because of their lower interests, most experts recommend secured loans for entrepreneurs and small business owners. If you’re looking to start a business, though, perhaps you don’t have enough revenue to obtain an unsecured loan. Lenders typically look at a business’s revenue, growth prospects, business plan, and credit history to determine candidacy for a loan. As such, an unsecured loan is a viable alternative. You’ll have to pay a higher interest rate, but you won’t have to place any assets up for collateral. This article brought to you by Intrepid Executive Group – A Global Financial Services Company. For more information on startup and business funding, please visit our website. What is an Equipment Lease Buyback? Funding Basics – What is Acquisition Financing?